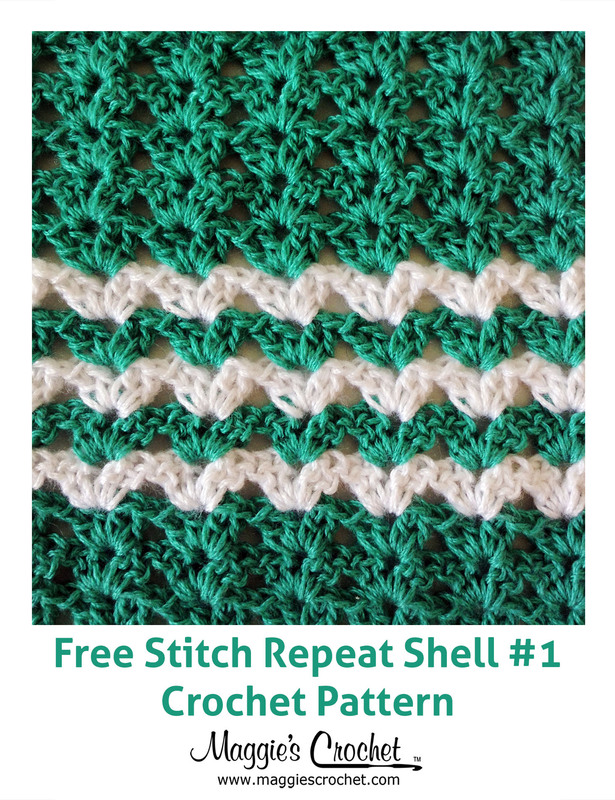 Home » Crochet • Crochet Patterns • I'm Hooked! • Maggie Weldon • Maggies Crochet • Recipes from the Heart » Gingerbread Season Is Back! Autumn brings with it a lot of wonderful things, crisp weather, beautiful colors, and of course the holiday season. Yes, the time has come yet again for the plethora of family get-togethers as the season of gift and food rapidly approaches us. 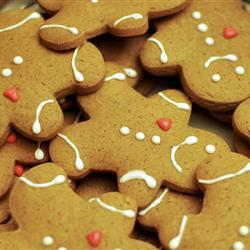 So keeping with the season of food and fun, here is a wonderful little gingerbread recipe I discovered on the internet! Bake for 10 to 12 minutes in the preheated oven. When the cookies are done, they will look dry, but still be soft to the touch. Remove from the baking sheet to cool on wire racks. When cool, the cookies can be frosted with the icing of your choice (allrecipes.com). Gingerbread is a very wonderful holiday staple, and also doubles as a delightful Christmas decoration. But if you’re like most and would rather keep this spicy sweet cookie off your walls and on your plate, Maggie’s Crochet offers a wonderful alternative in its gingerbread crochet patterns! Both adorable and long lasting, these gingerbread creations will sure to bring on the holiday spirit for years to come. This four-piece crochet pattern kitchen set is bound to get everyone feeling the joy. 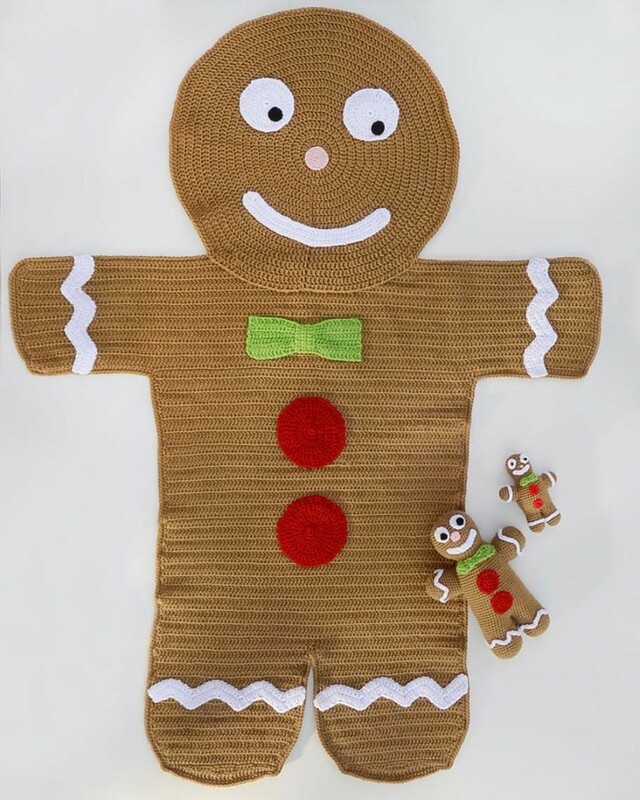 The Gingerbread Kitchen potholder and towel set includes Boy Gingerbread, Girl Gingerbread, Gingerbread House Potholder and Gingerbread House Towel Topper. 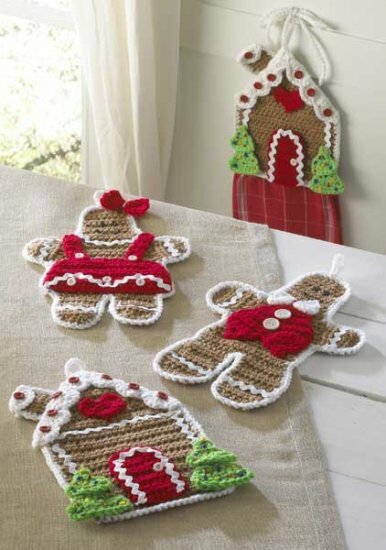 Have fun crocheting these holiday accents that will give your kitchen a festive look and feel. Click the photo for more details & to purchase. 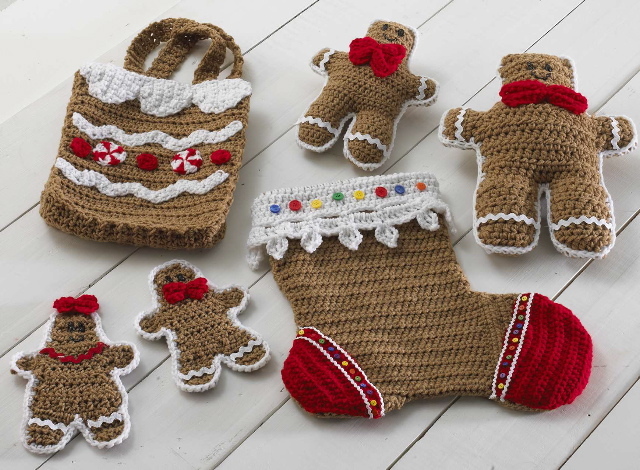 Another wonderful decoration staple can be found in the Gingerbread Stocking and Gift Set Crochet Pattern. 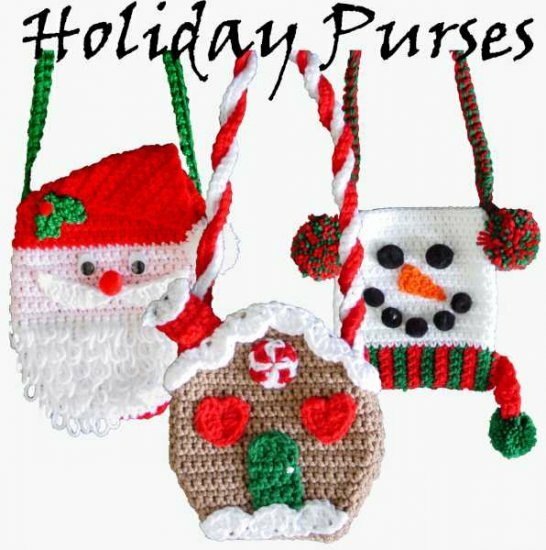 This delightful holiday crochet set features five patterns to give you plenty of cute decorations. The Gingerbread Stocking is 14 inches tall, and will add the right touch to a fireplace mantle or hanging on a door. Holiday cards that you receive get their own special hanger with the Gingerbread Boy and Girl card holders. The Large and Small Gingerbread Man toys make great gifts, or a stuffed toy for your child to play with during the holidays. Give the tree a homemade flair with this adorable Gingerbread Christmas Tree Skirt pattern. 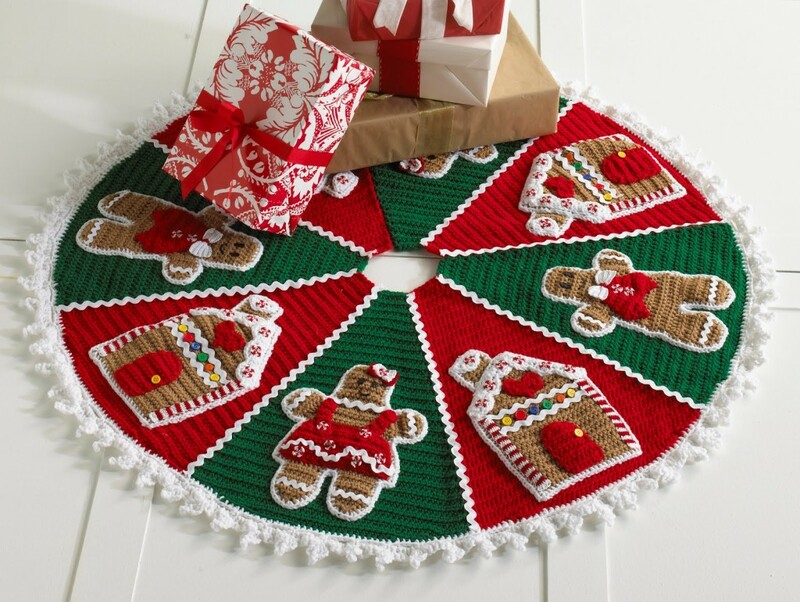 Measuring 48 inches in diameter, this wonder gingerbread theme is sure to make those Christmas presents look extra special for this and every future holiday season. While you’re decorating the bottom of the tree, why not add some gingerbread to the rest of the tree as well? 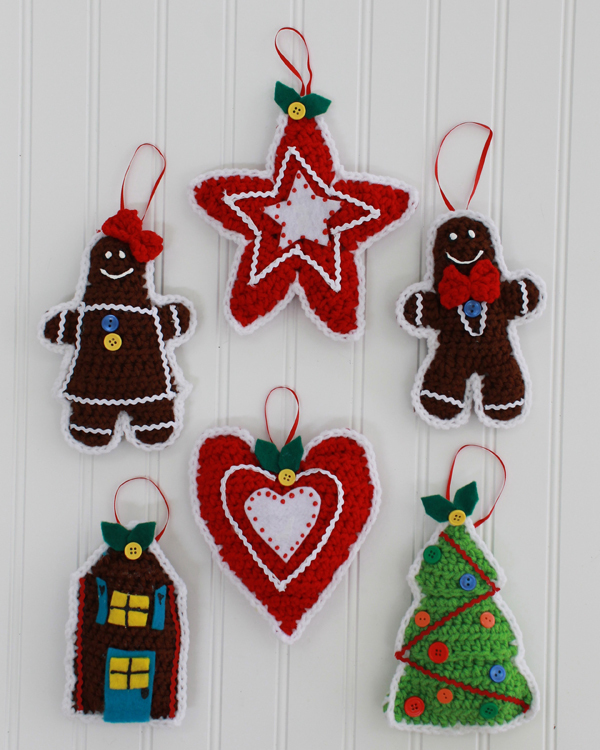 Tree trimming will be even sweeter with these adorable Gingerbread Christmas Tree Ornament crochet patterns. These six designs range from a star, a boy and girl, a cute little tree, and a house. If you have a little one in your household, then this afghan and toy should be perfect for you. The Gingerbread Afghan and Toy pattern is sure to bring sweet dreams, and peaceful naps to your baby this holiday season. Also makes a wonderful gift to a new mother. Take the gingerbread out with you with this adorable Gingerbread Purse pattern. A wonderful addition to your holiday wardrobe, this festive purse is sure to get smiles and compliments wherever you go. This pattern is perfect for little girls who want to tote around their treasures like Mommy. Another wonderful addition to your holiday wardrobe can be found in our Playtime Gingerbread Scarf Pattern. Be it with the purse or by itself, this sweet creation is perfect installation for the entire season. However you choose to decorate this holiday season, make sure you add a little personal touch to make it extra special and memorable. Like always, thanks for reading! If you would like to share the joy of crochet this Christmas, be sure to read Maggie’s Ten Tips On Teaching Children To Crochet.